Diving in, you need to know the super hero character cast and their alter ego, and possibly their second (more diabolical) alter ego, as well. There’s a handy guide at the book’s opening. Principally, we have Nova and Adrian. Nova’s superhero alter ego is Insomnia. She can put people to sleep on contact, but she never sleeps herself. She is also Nightmare, who works for the Anarchists, who have planted Nova into The Renegades to try to bring them down from the inside. The other character in question is Adrian, the son of the city commissioner, and his superhero identity is Sketch. Anything he draws can materialize into a three-dimensional tool. Adrian is crazy about Nova, but that relationship is obviously doomed. 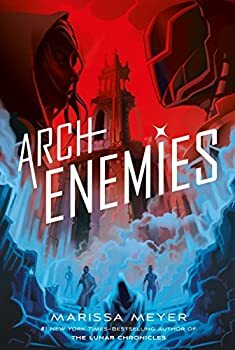 Archenemies is a book targeting a reader who is a blank slate. It means to uproot senses of the established “right” and “wrong” and turn them upside down, muddy the water and prick your sympathies for the “bad guys.” If you are a reader that also happens to be the ideal jury candidate — someone who can forget their own ideas and follow the narrative of facts and law, as set up by the legal defense or the prosecution, you might really enjoy this novel. Me, I get hung up on the words and what I know them to mean, and how Meyer uses them, heavy handedly to make her points. I mean, Renegades? The establishment police unit is called The Renegades? They may as well be the Anarchist criminal gang. 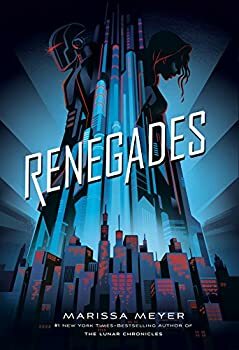 If we are going to make The Renegades so corrupted by power and authority that they are effectively a group of thugs, preying on the less powerful, then this is a different kind of story. They aren’t that. They are an imperfect group of super heroes doing their best to crime. The Anarchists are largely composed of truly diabolical types. I mean, a puppeteer who entrances children and forces them to do his bidding? That’s really evil. And when there’s no question of guilt, are we really supposed to be sympathetic when he’s stripped of his superpower? I’m not. I do want to be able to look at matters from an opposing point-of-view, but the author’s efforts to write a complex and multi-faceted story here were too overt, and they lack the imagination and lift necessary to carry a reader away with the story. I had to abandon Archenemies it before the half-way mark. Published in November 2018. The Renegades Trilogy continues, in this fiercely awaited second installment after the New York Times-bestselling Renegades by Marissa Meyer, author of the Lunar Chronicles. Now a New York Times Bestseller! Time is running out. Together, they can save the world. But they each other’s worst nightmare. Nova’s double life is about to get a lot more complicated: As Insomnia, she is a full-fledged member of the Renegades, a syndicate of powerful and beloved superheroes. She works with Adrian’s patrol unit to protect the weak and maintain order in Gatlon City. As Nightmare, she is an Anarchist – a group of of villains who are determined to destroy the Renegades. Nova wants vengeance against the so-called heroes who once failed her when she needed them most. But as Nova, her feelings for Adrian are deepening, despite the fact that he is the son of her sworn enemies and, unbeknownst to Nova, he has some dangerous secrets of his own. In this second installment of the Renegades trilogy, Nova, Adrian, and the rest of their crew – Ruby, Oscar, and Danna — are faced with escalating crime in Gatlon City, while covert weapons and conflicting missions have Nova and Adrian questioning not only their beliefs about justice, but also the feelings they have for each other. The line between good and evil has been blurred, but what’s clear to them both is that too much power could mean the end of their city – and the world – as they know it. Such an interesting theme, but certainly one that is difficult to navigate without falling into familiar answers and even cliches. I’ve read a few books (and more than a few comics) that feature adult characters in a very similar set-up with similar themes, and those tend to be more successful. Yes. And I like superhero stories. It probably came down to subtleties, but subtleties really matter to me. Call me a grumpy old woman.